I'm always up for a good contemporary. This sounds like something in the vein of John Green and Rainbow Rowell. Even the cover evokes Rainbow Rowell to me. "I am a collection of oddities, a circus of neurons and electrons: my heart is the ringmaster, my soul is the trapeze artist, and the world is my audience. It sounds strange because it is, and it is, because I am strange." After the sudden collapse of her family, Mim Malone is dragged from her home in northern Ohio to the "wastelands" of Mississippi, where she lives in a medicated milieu with her dad and new stepmom. Before the dust has a chance to settle, she learns her mother is sick back in Cleveland. 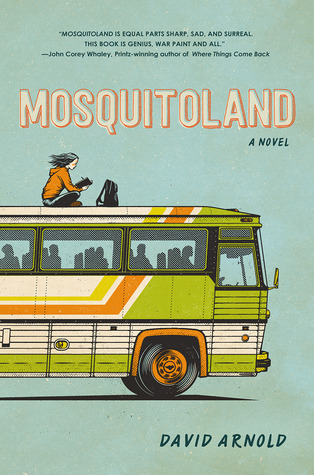 So she ditches her new life and hops aboard a northbound Greyhound bus to her real home and her real mother, meeting a quirky cast of fellow travelers along the way. But when her thousand-mile journey takes a few turns she could never see coming, Mim must confront her own demons, redefining her notions of love, loyalty, and what it means to be sane. That's a new to me one! Doesn't sound like my kind of read but still hope you enjoy reading this one! This sounds really interesting and this is the first I've heard of it! I'm not sure if I'd read it, but I really hope you like it when you get your hands on it! I haven't heard of this one before. I hope you enjoy reading it. Love the cover and the title of this one! Great pick! This book does have a John Green and Rainbow Rowell vibe to it. If it is anything like their books then I'll be sure to check this one out. Thanks for putting it on my radar as I haven't heard of this one before. Oh yes, very much a Rainbow Rowell vibe! Adding it to GR now, thanks!